According to the famous Garden of Eden story in the Bible, Eve was not so much born as sprouted, growing from a rib that the Lord took from Adam’s side, after Adam had failed to get along in any meaningful way with other species. 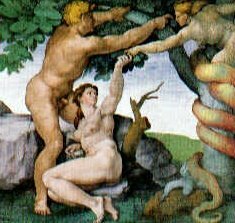 Tempted by a talking snake to eat fruit from the Tree of the Knowledge of Good and Evil – the one forbidden tree in the Garden of Eden – she ate and persuaded Adam to join her. The snake had promised that they would be like God, but in fact the only difference was that they realised they had no clothes on. So there you have my excuse for posting a picture of three nudes ~ religious freedom. Another reason is that, thanks (once again) to the J-Walk Blog, I have discovered that there is astonishing new DNA evidence that human beings did not evolve from ape-like creatures. ‘Internationally respected biochemist’ Dr. Fazale ‘Fuz’ Rana, says, “With the discovery of what scientists have aptly named Y-chromosomal Adam and Mitochondrial Eve, new genetic and DNA evidence with the fossil record show very clearly that modern humans are not related to previously existing hominids as once believed. “There is astonishing new evidence to support the position that homo sapiens exploded onto the scene less than 100,000 years ago from a single man and a single woman. Dr. Rana has been assisted in his researches by none other than Dr. Hugh Ross, author of several books, including Lights in the Sky and Little Green Men. *Cockney rhyming slang = Would you believe it? Nice to know I’m preaching to the converted – even if you don’t want us to know who you are. That book proposed that humans arrived by two inter-galatic space ships named Adam and Eve.. It works for me as well as any other bizarro theory. Oh BTW..the book manages to explain Alantis and Bermuda triangle as well .. not bad for just over 100 pages..